Cruise courtesy of Royal Caribbean as part of Brandcation. All opinions are my own. 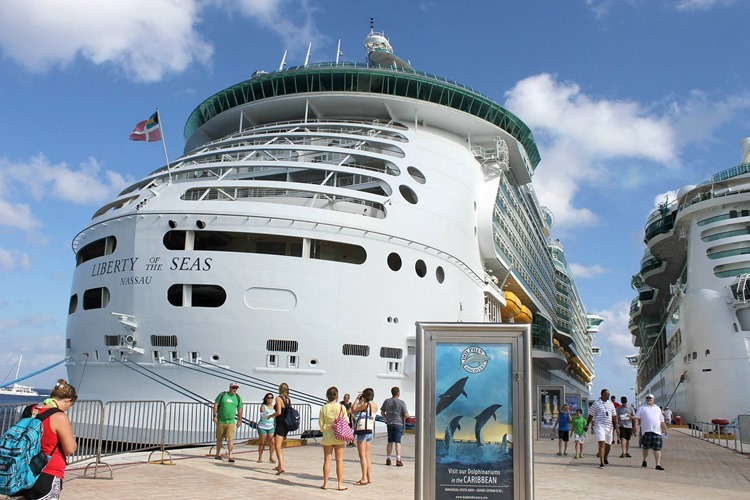 Royal Caribbean’s Liberty of the Seas is the third largest ship on the ocean today. Built in 2006/2007 she boasts a gross tonnage of 154,407. Measuring 338.9 meters long and 38.6 meters wide she can hold up to 5,728 people including crew members. That’s a lot of food to make. Every week the Liberty of the Seas serves 125,000 meals (including it’s crew members). This includes 60,000 appetizers, 84,000 main courses (69,000 of which are steaks), and 90,000 desserts. There are three main dining rooms on Liberty of the Seas: The Botticelli on Deck 5, The Michelangelo on Deck 4, and The Rembrandt on Deck 3. Our group of ladies was assigned to dine at The Rembrandt during our cruise. If you click on the photo above you can see a panoramic photo I took from deck 4. It’s beyond amazing. Dinner options vary each night, but I thought this shot of one of the menus would give you a good idea of the options available. As you can see, on the left side is the suggested meal. 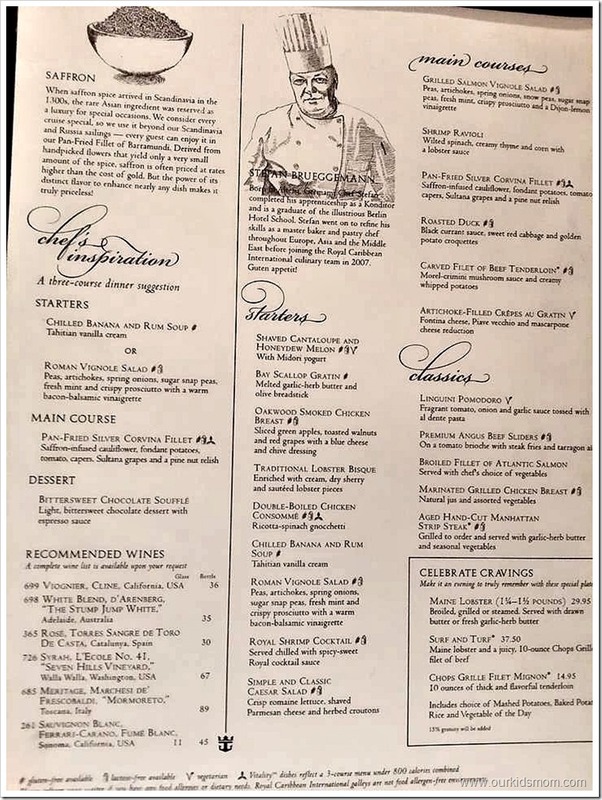 On the right are all of the available options and in the lower right corner you can always upgrade your meal for a small fee. 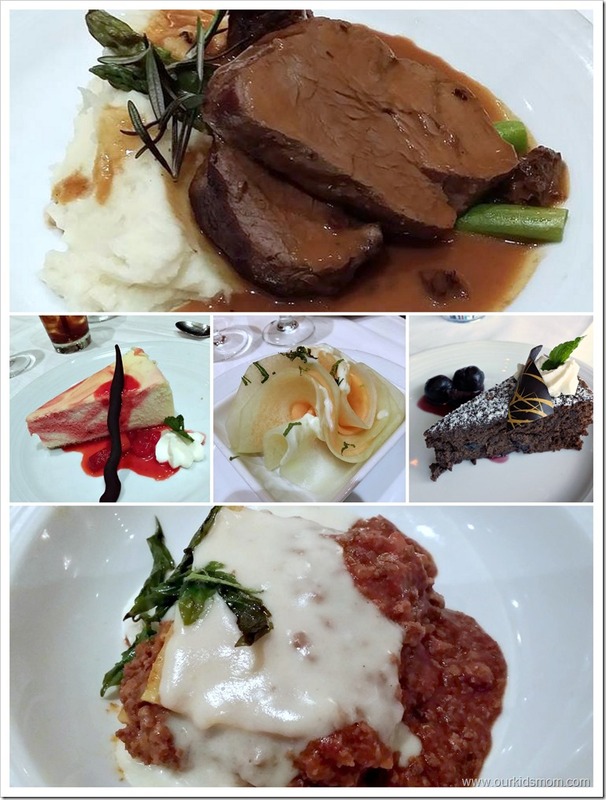 The main course options ranged from beef, chicken and seafood to duck. To be honest, I didn’t stray from the beef options because they were all so incredibly delicious and perfectly cooked. The lasagna melted in my mouth and left me wishing for more (thankfully it was gone, though… my tummy was full!). The desserts are sinfully good! Don’t wait until night three to realize that you can order more than one. I tend to like to order a few and share! Breakfast and lunch is served in the main dining hall if you care to sit back, relax and be waited on… but sometimes you just want to eat and get back to the festivities. 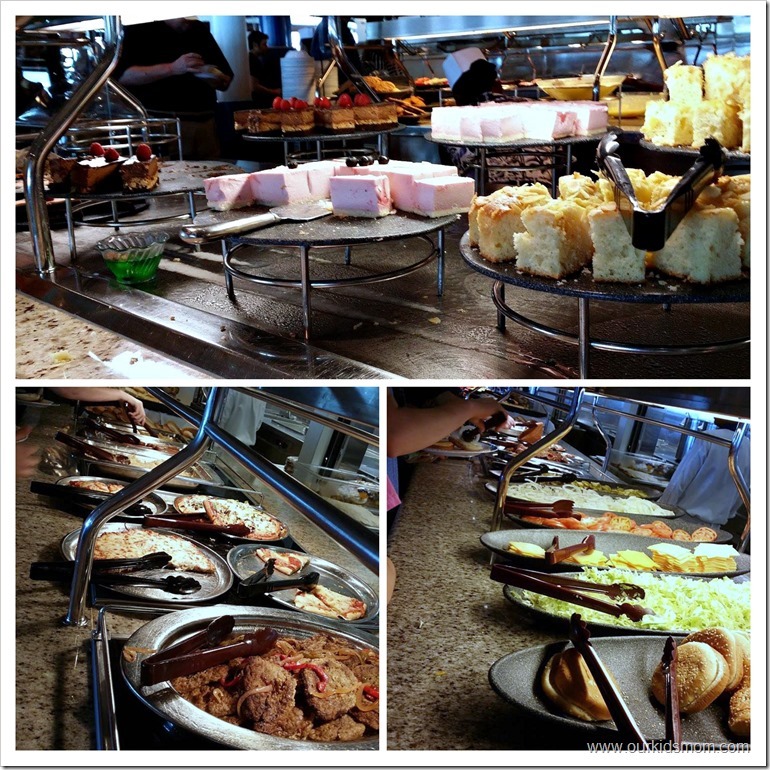 The Windjammer buffet is there for you! Above is a shot of one side as you come in (there are buffets down both sides with seating all the way around). The single buffet you see there is multiplied many times over the further you walk back all with different options. I didn’t get any breakfast photos, but they offer the traditional fare from scrambled eggs, bacon, sausage, pancakes and French toast. Are you an oatmeal kind of person? Yep they have that, too. One word of advice, though. If you like EGGS… skip the bowl of scrambled eggs (I’m not positive, but they taste powdered) and head for the back bar. They make omelets, fried and fresh scrambled there by request and they are perfect. Lunch and dinner options at the Windjammer offer everything from fresh fruit, hamburgers, pizza and pasta to Indian food options (great for vegetarians) and a buffet full of carved meats. If you have a special dietary need be sure to let the cruise line know 45 days before sailing so they can accommodate you. They can accommodate gluten free, kosher, low-fat, lactose-free, soy milks, Ensure, low-sodium meals, vegetarian and food allergies. Sorrento’s offers delicious pizzaria type pies just about any time of day. Are you headed to the casino, nightclub or pool after dinner? If you get a case of the hungries and you can’t or don’t want to go to the dining hall or buffet, this is a great option. I had never tried “California Pizza” before so I thought I’d give it a shot. Yes, that’s avocado, chicken and tomato on it. Strange, but good flavor combination! 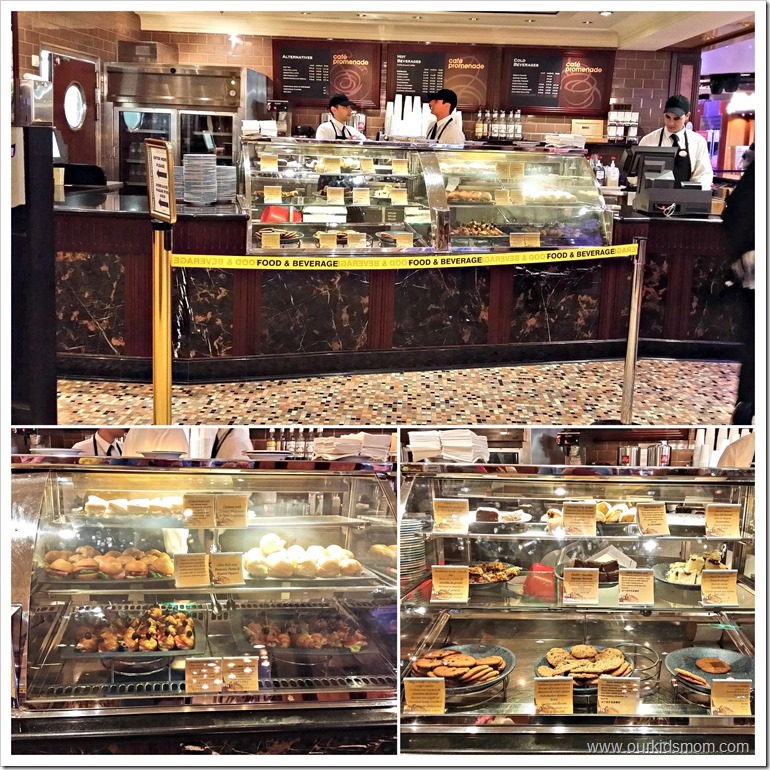 To be honest, I didn’t step into Café Promenade for several days. I honestly thought everything they offered was for a price because that is where you get premium coffees. I did not realize until later that all of the delicious goodies and sandwiches in the case were included with the cruise! I allowed myself to try a brownie and was actually happy I hadn’t found it earlier. It was so delectable I might not have been able to stay away! 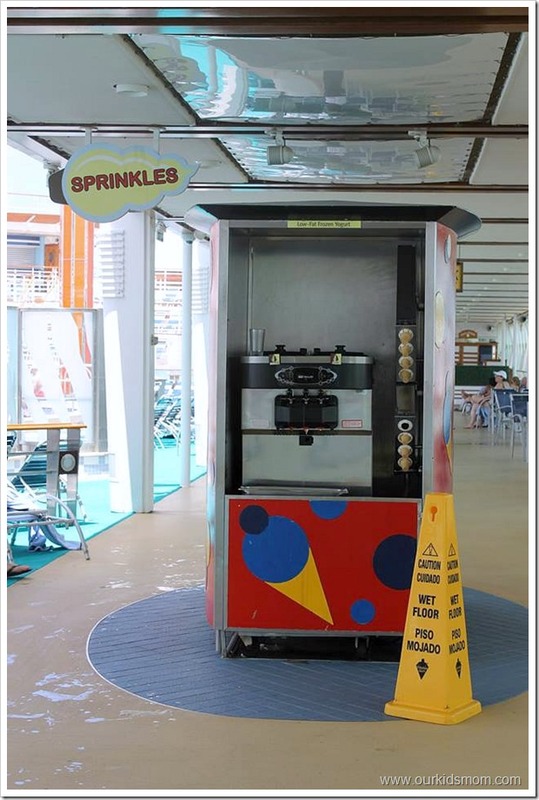 If the heat is getting the best of you, there is a soft serve frozen yogurt machine aka “Sprinkles” on the pool deck that offers a free refreshing cone. The girls and I took advantage of this a few times while just passing by. The vanilla was exceptional. The rest of the food destinations I have left to share all come at an additional charge. I did notice, though, that prices were very reasonable so I wanted to share. 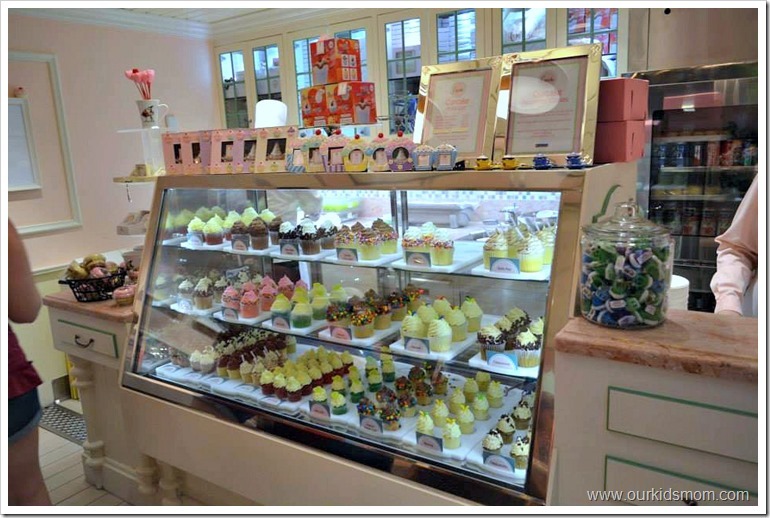 The Cupcake Cupboard offers cupcakes that are amazing both visually and taste wise (at an additional fee). We were fortunate enough to take a cupcake decorating class with the head pastry chef that I will be sharing later on. Johnny Rockets is also available for your lunch and/or dinner option. I noticed on the menu is stated a $5.95 cover charge gratuity included. A few of the girls ate there and said it was “good!”. They posted a cute video of the crew singing “Go Johnny Go!” for them. I wish I had had one more night on board so I could have experienced this option. Last but certainly not least is Ben & Jerry’s Ice Cream. Also at an additional charge, it’s the perfect spot to cool off and enjoy top notch ice cream. This was just a highlight of what I experienced while on a 4 night western Caribbean cruise aboard Liberty of the Seas. There are a few more dining options that I didn’t have time to check out like the upscale dining options. There is never a lack of options and remember to ask for what you want. In most cases, it’s yours! I know that cruises have great options for food, but I didn’t know that they had this much variety and selection. Yummy!! Oh Kerri, this and so so so much more. Something for everyone, that’s for sure! The food was amazing! I am getting hungry just thinking about it right now. P.S. 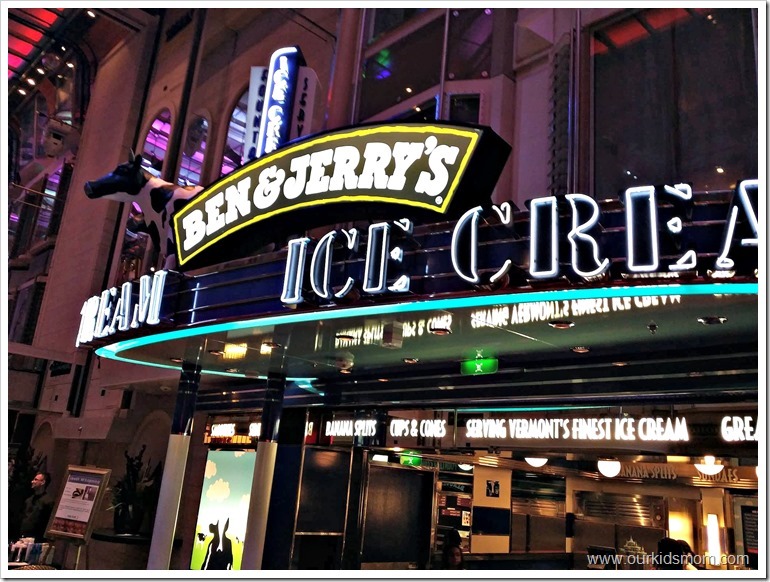 Don’t try to stay on a diet while you are on the cruise, give in and eat! Royal Caribbean has wonderful foods. My stomach started growling as soon as I started reading this post! I came back to comment and my stomach starting growling and my mouth watering. I didn’t have anything I didn’t like, that’s for sure! Oh so many tasty options! Very thorough post. Thanks Sheila! I’ve thought it more times than I care to admit… I’d love to just walk the kids down and let them grab what they want. They are so picky it’s painful sometimes. I’m up for this as well Lynsey. I didn’t get to try Johnny Rockets, so I HAVE to go… you know, so I can make an educated decision. But it all looks so appetizing! Thanks for sharing! Oh my, I totally should not have looked at this post before dinner. Everything looks so good! I am in awe of the salad picture. That is a ton of salad plates. Everything looks and sounds divine! 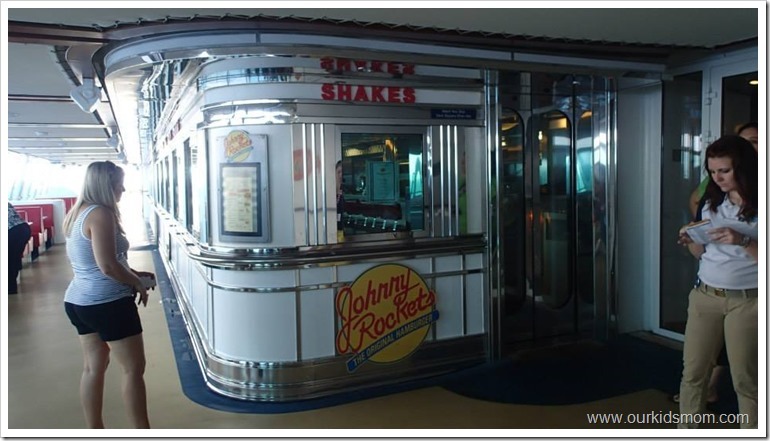 And I’d have to eat at Johnny Rockets at least once…. love ’em! I would gain at least 20 pounds on that cruise. Food looks awesome. Banana and rum soup as a starter? Yes, please! Gorgeous food and gorgeous ship! 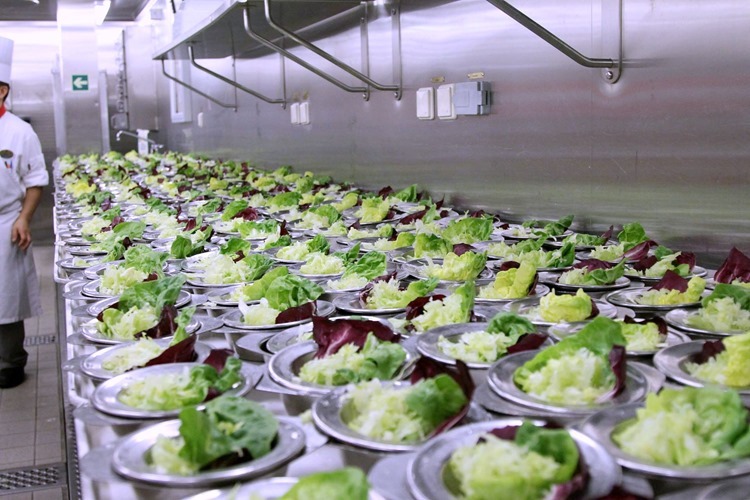 It is kinda awe inspiring to see all those salad bowls lined up. That is a lot of lettuce! 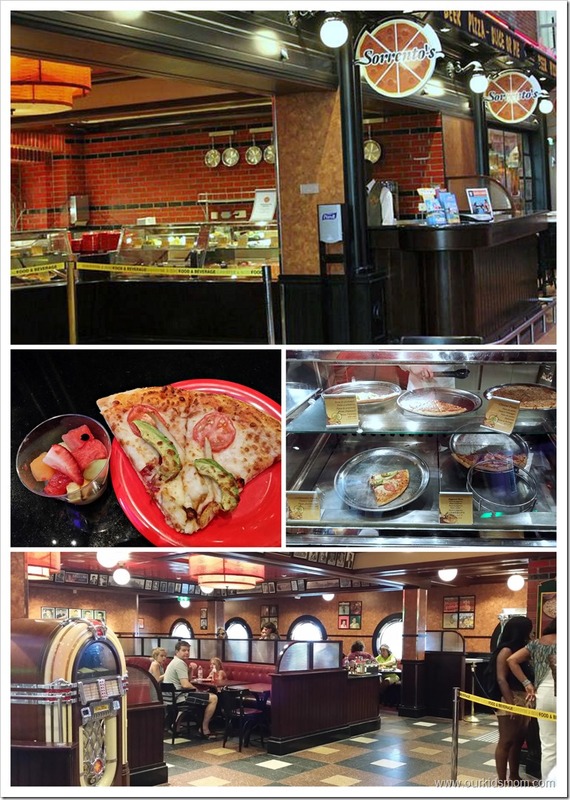 My favorite foods on the ship were the pizza from Sorrento’s and Johnny Rockets. Is it bad that the main reason I want to go on a cruise is all of the food?! Man my mouth a watering reading this. I ate at that cafe like 9 times…which explains the 2 pounds I gained. 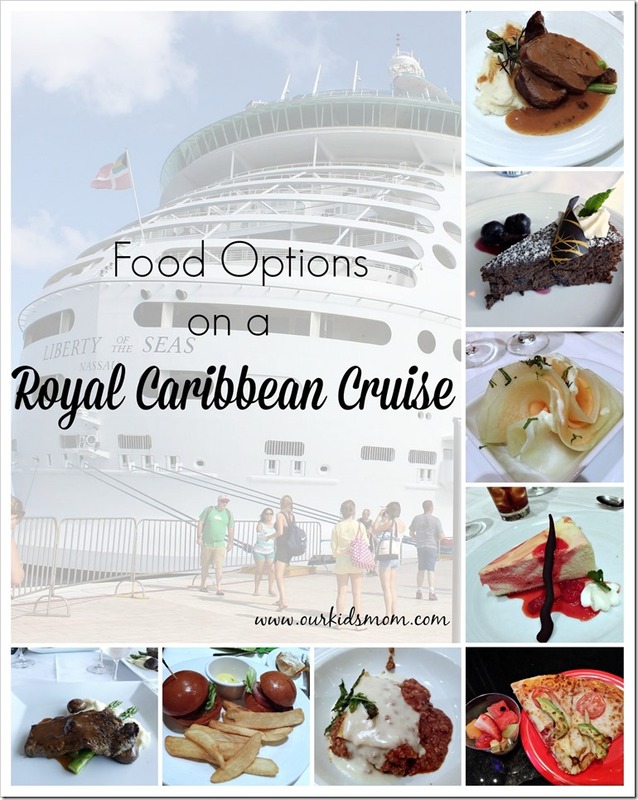 I’ve never been a cruise, but the food alone makes me want to go on one! Holy cow! I can’t believe that all of that is on a BOAT, that is just so cool! I took a cruise once and couldn’t believe all the food I could have. I managed to walk around the ship a lot just to burn off those calories. Such good food! I want to go back! I never went on a cruise before, but boy, looking at all that good food on this webpage, makes me want to go even more! What a great selection and a clean attractive dining room! I would gain 10 pounds easy!! 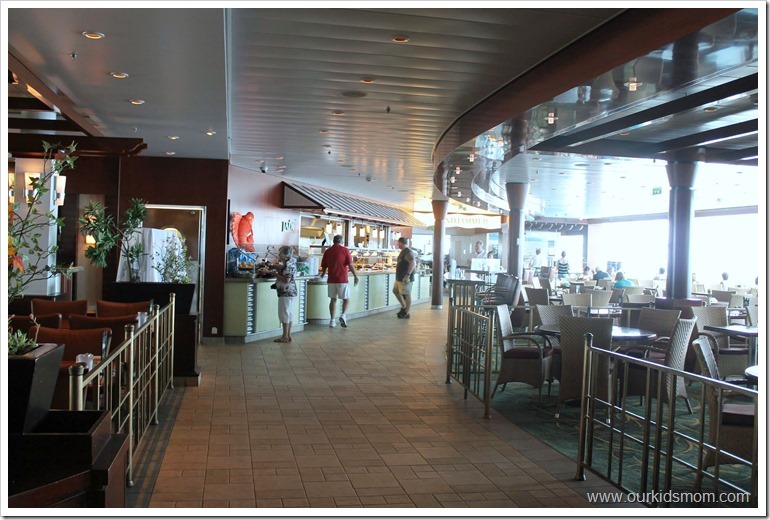 OMG, Heather…..all that food, all those options, how I would love to take this cruise!! I’ve never been on one, and always wanted to go. The only “ship” I’ve been on is that Staten Island Ferry, and the food there varied from cold coffee to ancient hot dogs. Not quite the same experience as you had! We have just been home for 8 days from our (first but not last!) 7 night Western Carib cruise on none other than LIBERTY of the SEAS! Such fun reading your review with all the great details – good job! Several of your pics had me thinking, “yeah, I was standing *right there* 10 short days ago..!.” Sort of made me homesick for the ship! 🙂 I will add my 2 cents worth. The food on this ship is phenomenal. EVERYTHING was great! What is the dress code for men in the dining room at night? Understand the two formal evenings but what is appropriate other nights? Men: shirt, tie, sport coat?